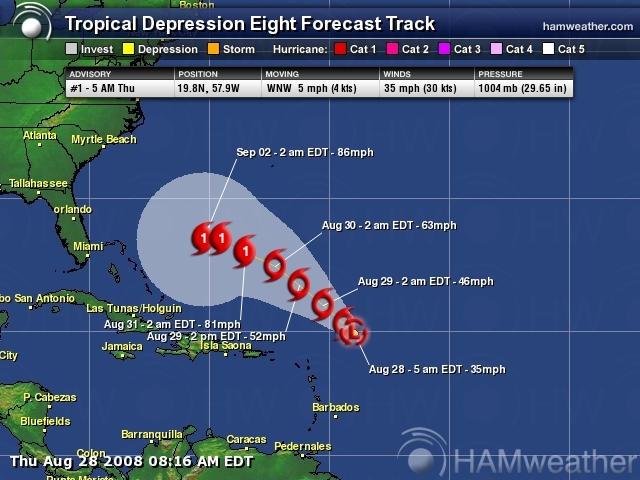 Tropical Depression 8 is out in the open waters of the Atlantic Ocean at this time posing no threat to land. 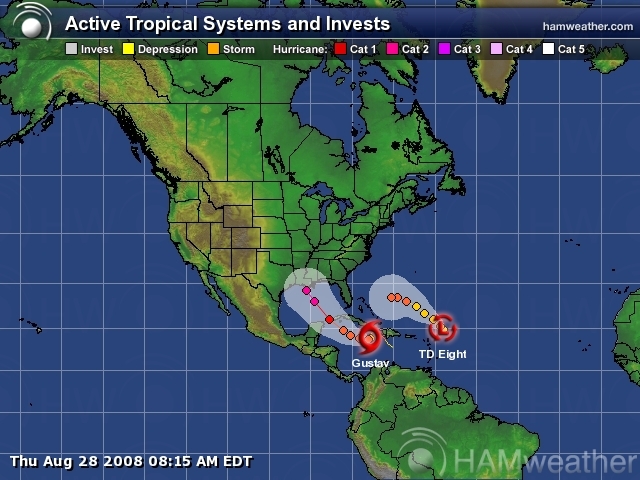 She is expected to become Tropical Storm Hanna later today and a hurricane before Labor Day. The storm is expected to maintain a west-northwesterly / northwesterly track through early next week when most models indicate a turn back to the southwest toward the east coast of Florida. The storm is currently at 19.8 north and 57.9 west or about 355 miles east to northeast of the northern Leeward Islands. Winds are currently at 35 mph with gusts up to 45 mph. It is moving to the west-northwest at 5 mph with a pressure reading about 1004 mb or 29.65 inches. Tropical Depression 8 is showing some signs of better organization with a ball of thunderstorms recently developing around the center. 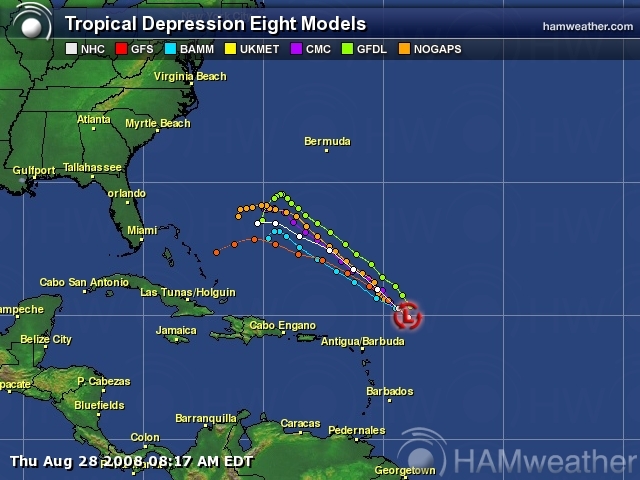 Tropical Depression 8 could become Tropical Storm Hanna later Thursday morning or early afternoon. This system is in a favorable position for further intensification with warm waters and a low-shear environment. TD 8 should move in a westward manner during the next few days with gradual intensification. This entry was posted in Hurricane Season, My2bucks Eye On The Tropics, News, weather and tagged Hurricane Hanna, Hurricane Hanna computer models, Hurricane Hanna Spaghetti Models, spaghetti models, Tropical Storm Hanna, Tropical Storm Hanna Spaghetti Model. Bookmark the permalink. Wow, this is a hurricane season. This is a good blog for storms.